Do Androids Dream of Wild Sheep Chases? I'll often attend an author's reading for a book that I've read. More rarely, I'll start reading a book after encountering an author through a reading. The Android's Dream may mark the first time that I've read a book because I missed an author reading. Scott pointed out a while back that John Scalzi would be doing a book reading in The Mission. I hadn't heard of him before, but the little research I did was encouraging. He's a sci-fi author who operates below the mainstream's radar but has acquired a very vibrant fanbase and some critical acclaim. I resolved to attend this reading, even going so far as to RSVP on his facebook page. Then life intervened and I missed the date. I still wanted to check him out, though, so eventually I got around to reading The Android's Dream, the main novel Scott recommended. It's one of the most purely enjoyable books I've read in a while... a flat-out adventure yarn, with enough political intrigue and intellectual heft to keep you from feeling guilty. It's kind of nice to take a break from authors who Intone Weighty Thoughts About The Human Condition and write really awesome fight scenes. I think this book probably classifies as soft sci-fi, but it's on the edge. Scalzi does seem to be technically literate, and writes far more intelligently about computers than I'm used to from anyone besides Stephenson. A fair amount of the action takes place in cyberspace with people hacking into systems, building artificial intelligences, and otherwise doing cool-yet-abstract things. Even though the book is set several centuries in the future, the computer networks Scalzi describes seem essentially like our own, down to the difference between wired and wireless nodes. This is both good and bad... it makes it more comprehensible, but at the same time, given how much technology has radically evolved in the past few decades, it's hard to believe it hasn't changed that much in the next centuries. Don't underrate comprehensibility, though. These sections of the book are fun to read precisely because of how familiar they are.... people not upgrading their passwords, critical Microsoft patches going unapplied, honeypots, message board fronting, griefers... it's very cathartic to see bad guys get their comeuppance whether it's in real life or in fiction. The political thriller element drives the main plot, and is very well crafted. Scalzi keeps you on your toes, partly by pulling things out of his rear at critical moments in the plot, but most often by coming up with really clever plots and interactions. The cast of characters is surprisingly broad, and early on it's a bit difficult to keep every person's name straight and recall what offices they hold, who they're officially working for, who they're secretly working for, and who they secretly hate. So much of the book reads like a tell-all book by a Washington insider: you learn how policy decisions were driven by personal vendettas, inane power struggles, undue influence from think tanks, or dumb luck. Again, it's strikingly similar to how our present world works, but unlike the technology, I have absolutely no trouble believing that government bureaucrats will behave exactly the same for generations to come. Besides technology and politics, the third pillar of the book is, surprisingly, religion. This is hardly the first time a church has played a prominent role in a sci-fi book, but I can't think of any other novel with something like the Church of the Evolved Lamb, and I think this may be the most interesting idea Scalzi posits in the book. The Church of the Evolved Lamb is a religion deliberately founded on a hoax, whose members commit to carrying out scripture that they know to be false. It's a bit like a more serious version of the Discordian Society. This gets right to the heart of the irrationality that is, by definition, at the core of all belief systems. By embracing this, the fictional Church becomes incredibly productive. Anyways... it's a bit refreshing to have a church that isn't primarily defined by being hypocritical, genocidal, avaricious, or power-mad. Ah, and let's not forget the action. Now that I think back over the book, I guess there are just a handful of fight scenes, but still, they are the things that stick in my memory. Scalzi has a wonderfully vibrant way of describing such things, creating really cool, elaborate set-pieces and then describing all the totally sweet things his heroes do in them. It's easy to imagine these scenes in a movie. I feel a bit like I've been on a literary smorgasbord lately... tasting individual novels from a ton of authors, trying to get a sense for what's good out there. The good news is that the answer is "Plenty". I do feel a bit bad that I rave about these guys, then inevitably move on to the next tray to try that instead of coming back for more. Still! I have no regrets, and have been lucky so far. It's great to build up a literary map and know in advance where I can confidently return for second helpings. So, I did go and see Coraline. My indecisiveness tends to make me inevitably postpone seeing movies in the theater... absent an easy invite from someone else, I tend to tell myself that I'll wait until the crowds die down, then that I'll wait until I can get cheap tickets at a matinee, then that everyone else has probably already seen it anyways so I'll wait for the DVD. Pat, though, pointed out that Coraline had the best use of 3D that he's seen yet in a movie, and I'm somewhat confident that 3D will not be an option on the DVD. That recommendation, combined with a delightfully rainy and otherwise useless weekend, prompted me to make the trek and watch it. On the whole, I enjoyed the movie a lot. I thought that the stop-motion animation was gorgeous, and in particular I LOVED the character design for Coraline. I'm delighted that they kept so much of the spookiness and weirdness from the original Gaiman book. As is often the case, I found myself impulsively focusing on every deviation from the source material, but this did much better than most adaptations, and the overall result felt quite faithful to the novella. Because I'm overly analytical, here's a breakdown of the major differences I noticed and what I think about them. WHITEY (or whatever his name is): Totally fabricated for the movie. I think I would have felt more charitably towards him if I hadn't recently read that New Yorker article talking about how movies cannot get made unless they are expected to appeal to at least two of the four broad quadrants of America. The original book was dominated by female personalities, and so it felt like they needed to bring in this new guy so men could "relate" to someone. Boo. Just having him in there isn't bad. What's more distressing is how it undercuts the strength of Coraline. Part of what I loved about the book, what was so unusual, was that this single, solitary young girl shows incredibly bravery in facing all kinds of nightmares almost entirely by herself. Now, in the movie, she gets rescued by a man. That feels like a step back to me. What's funny is that, if you asked me, "Do you prefer the message that people are self-sufficient to do things on their own, or the message that we can accomplish greater things by working together?" I would choose the latter message without hesitation. Still, that's not the message in the book, and it's a more mundane message. Not discarding all the above kvetching, if I accept that they did need to add a major male character who dilutes Coraline's awesomeness, at least they made a great character. Whitey isn't at all a conventional hero, and I dig his strangeness, that incredible character design (including a Splinter Cell mask, wow! ), and of course his floppy-headed-ness. PARENTS: Another step backwards in this book was its presentation of Coraline's parents. What we see on screen is a tired, overused stereotype: the Professional Parents who Work Too Hard and Ignore Their Child because they Do Not Know What's Really Important In Life. The real parents are snippy, dismissive, curt... all stuff that we've seen too many times in seemingly every other movie that features parents and children. Gaiman's parents weren't distant in this way. Nor were they warm and huggy-huggy. I dug his description because they were interesting: sure, they were busy, but I didn't get the impression that they were too busy for Coraline. They had senses of humor, and spark. In the book I felt like the dad was inventing a game for Coraline because he wanted her to be interested; in the movie, he's clearly blowing her off. Anyways. I think the movie would have been less rote and more interesting if they'd kept the quirkiness of the parents. That would have complicated their overly simplified moral, though. MORAL: As you can probably imagine, Gaiman's book can't easily be distilled into a simple moral message. It would probably be something like, "Imagination and curiosity are good, but can lead to dangers. Sometimes you have to be incredibly brave to do something, and this bravery is especially admirable if you are deliberately entering danger." The movie has a weaker and more conventional moral: "Parents should pay attention to their children and love them. Kids should love their parents. Being an individual is good." MAN UPSTAIRS: They kept the mice/rats, but other than that, he wasn't at all what I imagined. While reading the book, I wondered whether the other man upstairs was intended as a heavily veiled molester.... something about the writing was deeply uncomfortable and unsettling, with an air of menace about him. In the movie, he's such an outright farce (in both worlds) that it's hard to really fear him. I'm ambivalent on this change. It's less creepy, but they take advantage of the change for some absolutely amazing visual scenes with him, which I cannot blame him for. GEOGRAPHY: I don't remember if the book is set in any particular place. I think I kind of assumed that it was the English countryside. Well, we can't have an American movie filled with ENGLISHMEN, can we? In the same proud tradition as U-571, it was emphatically re-set in the States. I'm a bit bemused, but fine with the change. It helps that it's grounded in relatively unromantic settings: Coraline has moved from Michigan to Oregon. That feels real and believable The big catch, of course, is that it's absurd to think that this house has been in use for hundreds of years, and that Elizabethan-era urchin ghosts would be floating around. THE GARDEN: Gardening in general is new to the movie... there may be references to plants in the book, but I don't remember the parents being garden writers, nor any major scenes taking place in one. The garden proper was an enjoyable addition to the movie: the scenes in there are some of the most amazing in what's already a visually gorgeous film. Of course, in the book, Coraline confronts her "father" in the basement, not the garden, and I must say that the basement was even more menacing. It's obvious why they made the switch, though. You can write a really compelling passage about it being pitch black and not seeing anything, but it doesn't make for great movie watching. RESCUING: I alluded to this before, but I'm not super happy with the new role Whitey plays, in either world. He rescues Coraline from the mirror, then he unlocks the door to send her back to the real world, and then he saves her in the finale. Coraline is still a strong character in the movie, but could have been stronger. That said, it's not at all true that she's fully self-sufficient in the book... the stone she gets from the ladies is critically important, and the cat is enormously helpful as well. The stone feels less important in the movie than in the book, and I think that's OK.
Wow, I feel kind of bad for harping on so much. The truth is that I really did enjoy this movie a lot, and it turned out far better than I had any right to expect. I haven't even really touched on the LOOK of the thing, which is simply stunning. Oh, and Pat was right about the 3D. It's almost never about "let's point something out of the screen at you in a threatening manner". Instead, it provides a depth and a richness. On any given scene, if I looked for it I could see what it was doing, but it was enhancing what was on-screen rather than calling attention to itself. Yes, that's right: it was used like all great special effects are. Four-eyes like me may be interested to know that the glasses slide easily over your own spectacles. You might have some problem if you wear truly huge frames, but most people should be OK. It never got uncomfortable or dizzying. Your mileage may vary. And, because I always wonder about this when I DO go to see a movie in a theater: yes, there's something at the end of the credits. No, it isn't anything especially dramatic or funny, just a cute little treat for people who stuck around. Final verdict: the book and movie are different beasts. The book's story is better, but the movie is more fun to watch. If you have time, do them both! If anyone did this in the opposite order (movie then book), I'd be interested to hear your thoughts on how they compare. I guess you can officially call me obsessed with a series once I start doing inter-library loan requests. I'm trying to remember what books I've previously requested through LINK+, but I think they've all been stand-alones... The Third Policeman, for sure; The Mythical Man-Month (for some reason, San Jose just had the 1970's original, not the 1990's update); gotta be a few more that I'm overlooking. Be that as it may: I broke out the LINK+ to grab a copy of "Moving Pictures", my latest foray into Discworld. Moving Pictures is unique in that it is a coveted starter novel; in much the same vein as "Guards! Guards!" or "The Colour of Magic", it stands on its own, and sets up the novels that will follow it. 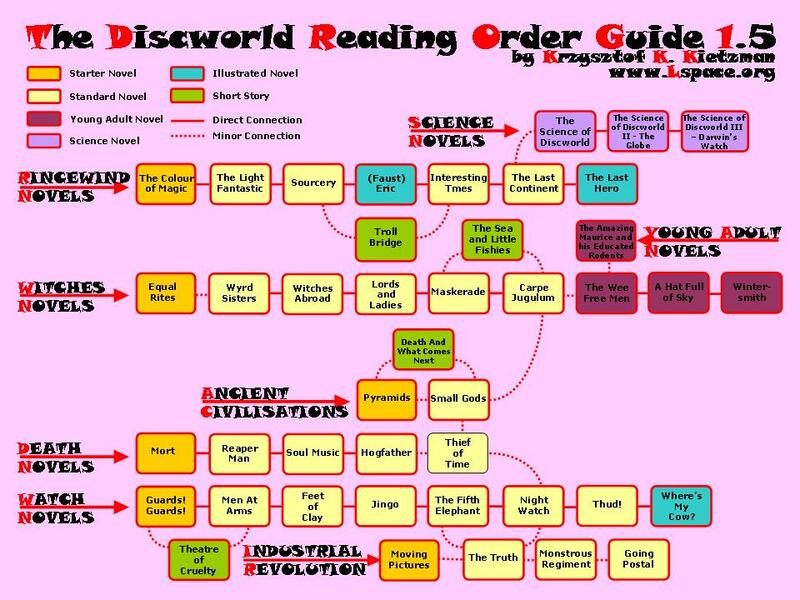 The particular chart I follow calls this particular flow the "Industrial Revolution" novels. I've already read and loved the final entries in there, which I think of as "The Moist Books." Moving Pictures is also unique because it speaks in a primarily parodic voice, rather than a satirical one. In fact, I think that contrasting MP with, say, one of the Guards books may be the best illustration I've come across of this fine distinction. I now would humbly offer up this flawed maxim: "Parody's primary purpose is humor, while satire uses humor to reach a larger point." Moving Pictures primarily deals with the Discworld's version of Hollywood - or, in their parlance, "Holy Wood." (Hey, it's early Pratchett - we can cut him some slack in his puns.) Like a lot of early books, it also spends a lot of time with the wizards, who apparently never got a timeline of their own but figure into every other series. The wizards are kind of funny in this way, since it's tough to match up their chronology with what happens in the other books. I believe that MP may be crucial, since it seems like this is the first appearance of Archchancellor Ridcully and Ponder Stibbons. While the wizards keep popping in and out of the story, the plot is initially driven by the Alchemists, which I believe is another first... they often appear in the obligatory lists of Ankh-Morpork's guilds, along with jokes about explosions, but this is the rare time when they actually do something. They invent... well, moving pictures, pretty much exactly like our movies, except that instead of exposing film to light they have demons scribbling out drawings (maintaining a technological innovation from the Rincewind books). What follows over the remainder of the book is a nearly non-stop parody of all aspects of Hollywood. We see a city and industry spring up out of a beautiful deserted place near the water. We see early attempts at education and culture quickly overrun by commercial concerns. We see enormous egos grow ever larger, the creation of agents, and fighting for points of the gross. Concessions are invented ("Banged Grains" replacing "Popped Corn"). And, along the way, almost every major film you can think of from the golden era is referenced, along with many beyond, from The Jazz Singer to Singing in the Rain to The Wizard of Oz to Jaws... all done in that very punny Pratchett way. There is a nominal threat and plot that keeps the action moving forward. For most of the novel, you think that Holy Wood is awakening an evil form of magic that is trying to break through into this world and sow destruction. Only towards the end do you realize that Holy Wood is actually a guardian against that evil. Bringing back the Dungeon Dimension from the Rincewind books (who I view as Pratchett's first stock villains before he invented the Auditors), he actually sets up a pretty cool situation. "Real" magic is no good against the Dungeon Dimension, since those creatures thrive on magical energies. The movies, though, are a special kind of magic: as in our world, it is a magic of illusion, of dreaming, of believing in the impossible. Briefly, then: Movie magic is the one thing that can guard against the Dungeon Dimension breaking in to the Discworld. And what do movie stars crave most? Fame, of course. An ancient "religion" required the "worship" of its "priest". Keep the meaning of that sentence, then substitute the words "film studio", "fame", and "star", and you have the picture. The last line of worshipers dies out, and Holy Wood tries to repair the damage. Pratchett had me going for most of the book... I didn't figure it out until after the scene where Victor "rescues" the damsel from the Cthinema. (Awesome name, by the way.) As they both notice, whatever is possessing her doesn't seem particularly evil, which got me to thinking about what other role it could be playing. It does end up putting you in an interesting position. All of that fame-grubbing, trickery, obsession, pandering to the lowest common denominator in order to reach the largest possible audience? It was all absolutely critical. Without the vast spread of crass commercialization, there would have been no magic at the Tower of Art, and the world would have fallen. So, what is Pratchett saying? That trashy entertainment actually has a valuable role to play? That it staves off our darkest impulses, giving our lives strength and freedom? Is he very obliquely making an argument for the value of "Discworld" novels themselves? Honestly, I doubt it. As I said above, I think that this book is pure parody. It's a very fun read, and really entertaining, but doesn't have anywhere near the bite or social depth of his later books. I often thought, "Heh, that's clever," but never "Wow, I never thought of it like that before." This is the work of an incredibly talented journeyman, and shows promising marks of the master to come. There are two stages to getting your financial house in order. The first is bedrock - ensuring that you earn more than you spend. The early part of this series has attempted to describe how to do that. The second stage is foundation - organizing your finances to provide security, so that even if an unexpected emergency occurs, you won't fall apart. This entry talks about the priorities you should look at, after you have worked out your income/expense picture, but before you start looking at serious investment. In rough order of importance, then, here's what you should try to do. What? If you don't already, get car insurance, renter's or homeowner's insurance, and medical insurance. If your job offers it, sign up for long-term disability insurance. Other types of insurance are optional, depending on your situation - for example, you can skip life insurance if you're single with no kids. How? When you can get insurance through your work, do so - it may feel expensive, but it is much cheaper than buying it as an individual, and infinitely cheaper than getting stuck without it. For things like auto and renter's insurance, talk with friends and family to see if they can recommend an agent. If you're already with a particular company, don't immediately switch unless you're unhappy; many offer loyalty bonuses if you stick with them for several years, and if you're a long-time customer, they may occasionally give you a break. Why? It's incredibly important. Odds are that you already have this stuff, but if not, get it as soon as you can. Without renter's insurance, if there's a fire in your place, you will lose everything you own; with it, they'll pay to replace your bed, your TV, your computer, everything. Premiums are not the place to save money, so don't skip them! What? Experts recommend keeping enough money here to cover between 3 and 6 months of expenses - think of rent, utilities, debts, insurance, food, etc. I recommend that you keep track of all your expenses for one month, subtract any truly unusual items (like plane tickets), then multiply by 3. How? You will automatically be accumulating this fund as part of your checking and savings account. Any money that isn't being spent becomes part of this fund. Eventually, you might want to move this money to a high-interest online savings account - more details on that in a future session. Even if you keep it in your normal bank, you might want to consider creating a separate account for it, so you recognize that this is "special" money that isn't available for spending. Any time you have to withdraw money from the account, re-filling it should become your top priority again. Why? Bad things can happen to any of us, but this fund will provide a buffer that keeps "bad" from meaning "catastrophic". If you have no savings, then you can only respond to financial emergencies by taking out loans, which probably carry high interest rates. You can spend years digging yourself out from under there. The emergency fund can be tapped to, for example, pay a medical or car insurance premium if you get in an accident. Also, if you lose your job, the fund will support you during the time you look for new work; without it, you could be forced to take the first job you find, just to make ends meet. 3. Pay off high-interest debt. What? This category includes your credit cards, store charge cards, and anything else with a high interest rate. The definition of "high" fluctuates over time; right now I'd consider this anything over 5%. How? Ideally, you want to pay off all such debt in full every month. Whenever you get a statement, check to make sure you have enough money in checking to cover it, then pay the whole thing off, either online or by writing a check. If you don't have enough to cover everything, then make sure you pay the minimum on everything, and as much as you can to the highest-interest item. After that's paid off, move to the next-highest, and repeat. Why? This will keep you from getting charged that high interest - interest takes money out of your pocket in return for nothing, so it's bad no matter what your goals are. Even though this is listed as #3, in practice it might be #2 for some people. If you have a usurious credit card rate of 33%, it will be very hard to build up your savings account while accumulating interest, so in that case you should pay off the card at the same time that you're setting a little aside for your savings. 4. Sign up for a retirement plan. What? If you work for a medium- or large-sized organization, you probably have access to a 401(k) plan, 403(b), or something similar. Open an account if you don't already have one and start saving. How? Talk with your HR representative or manager if you need to open an account or need information on how it works. You will generally specify a percentage of your paycheck to put into the account. Some organizations offer a match - for example, they might match 50% of the first 6% that you contribute. You should contribute at least enough to get the match - in this case, 6%. If you have more money available, consider saving even more. You'll have a choice of funds to invest in; we'll look at these in more detail in a later session, but for now, just sign up and start contributing. Why? The "employer match" is free money. You'll never be able to find another investment with a guaranteed 50% return, so grab it! Another great benefit is that your contributions are tax-free. Suppose that you earn $50,000 a year, and contribute 10% to your 401(k). Now, you'll only be taxed as if you earned $45,000 that year - extra money in your pocket! 401(k)s can go up and down over time - mainly down this year - but over the long term, you can earn much more money here than in other investments, so it's the fastest path to retirement. 5. Consider other retirement savings. What? In addition to the 401(k) and similar programs, you can also save money in an IRA or a Roth IRA. How? Open an account with an investment company - I like Vanguard, but you can also use T. Rowe Price, Fidelity, or other companies. Your bank may also offer these types of accounts. You can instruct the company to automatically transfer money from your checking account into this retirement account at certain times, or manually move it over yourself. Note that there are income limits on the accounts, a maximum amount that you can contribute each year, and you often can't contribute to a traditional IRA if you're also contributing to a 401(k). Why? The traditional IRA and Roth IRA offer other ways to save for retirement and save money on taxes. There's no match, but the Roth IRA has the advantage of letting your money grow tax-free - unlike the 401(k), you won't need to pay any taxes when you withdraw money from the account. These accounts can be a little complicated, so make sure you understand them, but like the 401(k) they are a great long-term vehicle to retirement. 6. Save for financial goals. What? If you have a big purchase coming up, like a car or a house or a vacation, set money aside to buy it. How? We'll cover this in more detail in the investment sessions ahead. Briefly, though, it depends on how long it will be until you plan on purchasing. If it's less than a year, just keep it in your online savings account. If it's between one year and five years, you can use your online savings account or a Certificate of Deposit. If it's more than five years, a mutual fund might be a good idea. Why? Whenever possible, you want to own things, not borrow them. If you take out a loan to get a new car, you're really just borrowing the car - the lender actually owns it. By saving up to make these big purchases, you're taking charge of your financial future. You're in the driver's seat, and can direct money towards reaching your personal goals. What? If you are debt-free, on track for retirement, and own everything that you want, then congratulations! You're in a wonderful position. Enjoy it. Don't let yourself get obsessed with making more money, and stay focused on your personal goals. Practice contentment. How? If you have a surplus, then look to your goals to see how to spend it. Maybe you will become a philanthropist in your city. Perhaps you'll donate to your college so they can build a new laboratory. It might be time to start up a new company. Or take that trip around the world. Or run for office - nah, skip that step and just buy a Senate seat! Why? Remember, the point of these exercises isn't to become the richest person on the planet. It's to identify what's important to you and fulfill your potential. Money can be an important tool for getting there, but once you've arrived, keep your focus on what's important, and not the sum in your bank account. The above priorities will probably take you from now through retirement. I've glossed over some details, though. The remainder of this series will look in more detail at how these various things work, starting with debt and credit cards, and going through the various types of investments. A short post on a short book! What is it about talented, bizarre writers that drives them towards children's literature? Roald Dahl is famous for his schizophrenic canon of creepily disturbing adult stories and his better-known children's fables. More recently, George Saunders, that master of strangely affecting satirical pieces, put out a warmly illustrated book that combines his incredibly ear for real human voice with a tale for tots. And the trend is continuing for Neil Gaiman, who I first encountered because of his books about Armageddon, Hell, religious pantheons, nightmare creatures who eat eyeballs, and the like... and, it turns out, has produced not just one but a whole parcel of stories for young readers. "Coraline" is technically a Young Adults book, not a children's book, so Gaiman can indulge a bit more in his macabre tendencies. Probably the most striking of these is the detail of buttons. In the other world that Coraline discovers, her family's doppelgangers all have buttons sewn on where their eyes would be. Creepy, huh? The mother threatens to do the same to Coraline, in one of those great cringe-inducing scenes. It doesn't stop there... you get to meet vicious rats (who sing in a menacing verse) living under the clothing of the man upstairs; dogs who morph into bats; a sticky cocoon surrounding two aged women with a sticky goo, through which Coraline must claw with her bare hands; and let's not forget the skittering menace that haunts the heroine during the book's final pages. The story seems to be pure Gaiman. His other works have really all been fairy tales for adults, so it isn't exactly a stretch to do a fairy tale for a younger set. It follows the classic English model: it starts in a well-grounded location that is utterly ordinary or boring, then the protagonist sees some evidence of a hidden, fantastic world, and eventually follows that evidence to enter the other world, experiencing great adventures that help them grow before eventually returning home. Writ large, it's the same plot as the Chronicles of Narnia, Alice in Wonderland, Peter Pan, G. K. Chesterton, E. Nesbitt... pick your Brit. Gaiman is following a grand tradition, and certainly holding up his legacy. A side note: books like this make me grateful for the library's requests system, where they'll collect books for you. I probably would have felt a little weird wandering into a Young Adults section to grab this book, but am very glad to have read it... it's good literature, and should be available to everyone. My family is pretty big on traditions. We like them so much, we're very open to creating new ones. For example, after moving to Illinois, we started the tradition of taking a family hike on Thanksgiving before dinner. We recently modified a Minnesota-era tradition of listening to Black Nativity and eating appetizers on Christmas Eve with a modernized version that keeps Black Nativity, nixes the appetizers, and includes a modicum of effort from the kids. My personal attitude is that, if something happens twice, and is good both times, then it's worth making a tradition out of it. That being said, I'm pleased to say that 2009 was the second entry in my dad's traditional visit to watch the Tour of California. As previously noted in these pages, I've enjoyed following the Tour since it started, but my pleasure has multiplied since getting the opportunity to share it. It's always great to spend time with Dad, and he's also more knowledgeable about professional racing than I am, so I win on both the familial and the sporting ends of that connection. I think we both managed to be more relaxed about it this time around than we were last year. Having done it once, we both had a better idea of what to expect (even though they change the route every year, the overall feel stays the same), plus I think there was less pressure now to do everything just right. In much the same way that later family trips to Florida were less packed than the first one, we could just relax and enjoy it. Not to say that there wasn't planning! I come from a very research-oriented gene pool, so we did spend some time tossing ideas back and forth and mapping out a game plan for the trip. I tend to be happiest when I have a framework to play inside of, ideally with a bit of adaptability to respond to unexpected opportunities or obstacles. Dad had originally planned to arrive on Thursday, but scheduling forces and Southwest fare changes prompted an eventual rescheduling to Friday. Which is just as well... I'll never encourage someone to NOT spend a day in California, but this ended up being a rare (especially for this drought-ridden year) rainy week, and most of the days were spent under water. Good news for us natives, bad news for visitors. So, the arrival on Friday happened smoothly. All connections at SFO and BART were carried out properly, and before long he was walking down the lovely (SARCASM ALERT) streets of SOMA towards my current place of employment. I got to show him around our super sweet office, then we had a very tasty and pleasant lunch at AK Subs. That ended up being even more fun than I had thought, just because it was nice to show off the space where we generally order lunch from. It's one thing to see what your son's experience is like; it's another to taste it. Dad explored the city on foot for the rest of the day. Amazingly, he had fit everything for his 5-day visit into a single backpack, and stubbornly insisted on carrying it. We briefly went over some potential outings, and I went back to being a software engineer while he took the grand tour. I later learned that he got a great hike in, walking through SOMA up to the Bay, along the Embarcadero, into Chinatown, then down past Union Square and back up to the Ferry Building before dropping down into the train station. We touched base there and headed home, ending up in the same car as Truc, and eventually landed in my apartment at my standard arrival time of around 7:30 PM. First night's dinner was leftovers. I cooked up some brown rice, then over that served some nuked New Mexico pork chili. On the side we had some leftover cheesy broccoli and rice casserole, as well as pomelo. This was his first time eating it. Pomelo is kind of entertaining to eat... it takes much more effort than the typical fruit. And I always enjoy exposing people to new fruit. Saturday was the first race day. I actually hadn't made this connection before, but Dad correctly pointed out that this is the first year that the Tour has started on a Saturday; previously, the first day has always been Sunday. I had initially been mildly irate to hear that Sacramento was hosting the Prologue, which in the previous three years has belonged to a Bay Area city. Once I calmed down, though, I realized that there was nothing wrong with that at all. There's a train line -the Capitol Corridor - that provides good service between San Jose and Sacramento, so I wouldn't need to make that deity-forsaken drive. Plus, Sacramento is only truly horrible during the summer. And who knew when Dad (or, for that matter, I) would be back to Sacramento again? All in all, it was a perfectly fine venue to kick things off. That morning we had muesli with sliced almonds, raisins, and mangoes. We drove up to Diridon, hung around outside our train for five or ten minutes, then got on when the doors open. We swiftly seized the best spot. Hundreds of commuting hours have primed me to swiftly and decisively claim what I want: a seat on the top car, far away from the engine, facing in the direction of travel. We got it in spades. The train ride itself is fairly long, about three hours in both directions. I am amazed to think that some people actually commute between Sacramento and San Jose. Still, I was more than happy to do it... we both brought books, Dad had an iPod and a crossword book, I had my MacBook. It didn't take much longer than the drive would have, and certainly was far more pleasant. Upon arriving in Sacramento, we ambled down through the Westfield Mall and onto the race route. As with the Prologue in Palo Alto last year, we walked along the entire race route before it started, scouting out lunch locations (verdict: there are not many) and just getting the feel of the route. We eventually grabbed some turkey sandwiches from a little window-front cafe after I threw a mini temper tantrum. Then we plopped down on the curb and awaited the race. Oh, and did I mention it was cold? I fully admit that I've become a wimp during my time in California, but even the Chicagoan by my side was having trouble. The temperature itself wasn't that bad, and when the sun shone it actually felt kind of nice. The sun didn't often shine, though. What we DID get plenty of was wind. We'd stumbled across a Severe Weather Advisory the night before, warning that a storm system from Alaska would be producing winds with gusts from 40-80 MPH. Still, we'd both focused on the raw temperature numbers and failed to plan accordingly. It wasn't actually painful, but we were both kicking ourselves for leaving some warmer gear behind. My self-pity was interrupted almost precisely once every 60 seconds, though, when a racer went by. In a major improvement over last year's prologue, this time the motorcycle rider preceding each of the time-trial racers was displaying that racer's name on their windscreen. In each of the previous three years, it's been almost impossible to know who you're watching at any given time unless you're standing by the start or finish line where the announcers are. This really brought everyone along the entire race track into the day, and led to a lot more excitement and cheering. Speaking of which, I think that Tour of California fans just may be the best fans of any sport. I know everyone says that about their favorite event, but seriously! Most people are pretty well educated about what's going on, and those who don't are eager to learn. Everyone was super nice, from the volunteer marshals to the people taking pictures to the hard-core race fans to folks out with their kids. Even in the chilly weather - social death to sun-soaked Californians - people were lining the streets as far as I could see in all directions. And people cheer for everyone... the least-known racer can't go by without receiving claps, cheers, cowbells, and much love. For the week or so prior, every piece of material advertising the Tour boldly proclaimed LANCE ARMSTRONG RETURNS! Lance is bar none the biggest thing to ever happen to American cycling, so of course it makes sense that they would tie their fortunes to his. There was a lot of excitement around Lance, and his foundation was heavily promoted... both officially, through people carrying printed signs and fans, and in a guerrilla manner, with people scrawling yellow chalk messages for LIVESTRONG. When Lance eventually came by, near the end of the program, he received probably the largest cheers of the day. Not only that, he had absolutely the largest entourage of the day. Most racers had a single support car behind them, with some meriting a mobile camera or a race official on motorcycle. (Team OUCH, impressively, rode solo.) Lance had a good five or six vehicles trailing in his wake, which was simultaneously amusing and bemusing. I had been curious what kind of reception Floyd Landis would receive - he was really beloved in the previous Tour, but it's entirely accurate to describe his current state as "disgraced." Either most folks didn't follow the news, or they didn't care: he got ecstatic cheers as well, and I didn't hear a single "boo". Last of the group, but certainly not least, came Levi Leipheimer, triumphantly wearing jersey #1. Year after year, Levi has been the favorite racer in the Tour. He seemed to explode from out of nowhere in the first year, and clearly pours his all into it. He's also a local boy, which people certainly notice and appreciate. Plus he's just a really classy-seeming guy. After the Astana debacle, it was wonderful to see him back in a country which loved and respected him. We swung by the reviewing stand after the race finished. We couldn't figure out how to get in front of the stage, but got quite close on the side, and so witnessed Governor Schwarzenegger. He bestowed awards upon the victors, and gave a really passionate and totally incomprehensible speech about California. I think he's in favor of it. From there, the evening wound down pleasantly and calmly. We returned to the Sacramento Amtrak station with plenty of time to spare, and enjoyed the heated benches in their very nice waiting room, home of the World's Slowest Free Wi-Fi. Then, a mere three hours later, we were back in San Jose! Sunday marked the first full stage of the Tour. Although the route has changed from previous years, it still ends in Santa Rosa, which is Levi Leipheimer's home town and also home to arguably the most enthusiastic race enthusiasts anywhere. We knew before heading up that it would be an even worse day for weather: the cold would not lift, and we would get plenty of rain as well. We drove up 880 in an almost constant downpour, which became torrential once we reached the north bay. An advantage of tradition: we had spent nearly an hour the previous year trying to find the magical mystery parking spot in Santa Rosa, so this time we could head directly there without needing to search. I'm still a bit baffled by Santa Rosa... they're obviously extremely committed to the Tour, and I don't want to slight them, but they have the least helpful city Tour web page of the bunch. If we hadn't been there before, we wouldn't have known where or how to reach the Fairgrounds; as it was, we needed to get directions from a young woman parking for another event in order to find the spot, which has no signs visible from the road. It works, but barely. This time, we got downtown in time to catch most of the Women's Criterium. Dad had explained to me how this type of race, which he helps marshal back home, works. It's run on a fairly short circuit of a mile or so, usually with lots of turns and curves. The race starts with a timed portion with the riders making lots of laps. After the time expires, it switches over to counting laps, and the prize goes to whoever finishes their laps first. As a result, you get a ton of action at the end, with lots of jockeying for position and flat-out speed. We grabbed a great spot to watch - I think that by now we've acquired a good eye for finding these. The race was pretty thrilling to watch, and we were just close enough to the finish line to catch the announcer's thrilled exclamations. The race went to Emilia Fahlin, a very young Swedish national. We cheered and clapped, then went to look for a place indoors to eat. Last year we had stumbled across a spot called Kabab & Curry which served up really tasty south Asian cuisine. We couldn't remember the name, and ended up ducking into a sports bar instead. It was still warm, as was the food... I got a chili burger and salad while Dad got a bowl of chili and french fries. The riders weren't scheduled to arrive in Santa Rosa until at least 4pm, so after we had finished at the bar, we went in search of a coffee shop. We found a Peet's, which is pretty common out here but apparently doesn't do free-standing shops in Chicago. They were doing gangbuster business on this day... who wants to stand outside in the cold damp rain when you could be warming your hands around the beverage of your choice? Dad braved the amazingly long line while I held down the fort, then we took our time with the drinks while following the Tour progress on my iPhone. I was stunned to read that Fabian Cancellara, the Tour leader, had abandoned the race. Evidently he had come down with a fever. This is the second year in a row that the leader has abandoned; the previous year, it was due to food poisoning. We left Peet's with plenty of time to walk around and find a viewing spot. We saw more of the course than we had last year, but ended up pretty close to where we had watched last time, across the street from an electric car storefront. I was absolutely amazed at the turnout. Even at the Criterium, the streets were packed with spectators. The Tour's circuit was longer and so more spread out, but even so, there were a ton of people outside, shivering in their jackets, gloves, and umbrellas. You can't ask for more from Californians. As before, people were totally into it, chatting excitedly with one another and cheering loudly when the advance cars started coming through. We would later learn that the organizers had shortened the race, but as far as we could tell at the time, it was going great. We all yelled our hearts out when the riders zipped past. The breakaway group in front held an incredible lead over the peleton, one that we quickly realized had no chance of defeat in the mere four laps they had in Santa Rosa. We watched them go around and around, then smiled at the far-off screams of the announcer: "MANCEBO!" It was over. We took Rosie the Trolley back down to the fairgrounds, then headed south. Our Santa Rosa journey covered mainly the same ground as last year's, but in the opposite direction: instead of going up the Peninsula, through Sausalito, then back up to Santa Rosa and eventually down the East Bay, we did it in reverse. The main reason for our San Francisco return was for a west-coast mini King Family Reunion. My cousin Paul and his wife live in the city, while my cousin Jennifer and her family live in the peninsula. We had arranged to meet at Baker Street Bistro, a neighborhood French restaurant, to reconnect with everyone. We first met with Paul and Alison at their apartment. It's an absolutely wonderful San Francisco flat, with an old-fashioned yet extremely comfortable look to it. Alison has lived there for close to a decade and has done a gorgeous job at decorating it. We chatted for a little while, then walked the block and a half to the Bistro. Jen, Jose, and Izzy were already waiting for us. It was great to chat with everyone... I've really enjoyed getting to see them more since moving out here, but still don't meet with them as often as I should. Paul and Alison filled us in on their recent trip to a healthy, relaxing resort in Mexico. I talked a bit about the cell phone applications I've worked on. Jen and Jose told us about their Facebook experiences and recent movies, and Dad shared the story of taking Paul to see Star Wars when he was 10 years old. The restaurant itself was great. It was a cozy place, with the wine racks right next to the tables, and an exposed kitchen where you could see the cook. A single waiter ran the whole place. I started with a tomato bisque soup and had a wonderful Bourride Provençale (sort of a fish stew) as an entree. As a bonus, it came with a really interesting risotto dish on the side. Everything that I saw looked really good, and it was possible the most reasonably-priced French food that I've seen on the West Coast. After dinner, we retired to Paul and Alison's. Paul's birthday was the next day, so we celebrated with some hot beverages and home-made cupcakes. We remained there chatting for a good long while before everyone said their goodbyes and headed out. I chose to return on 280 instead of 101. Take that, Google Maps! President's Day dawned with more of the same weather: cold, cloudy, wet. I had reluctantly but unequivocally abandoned my original viewing location ideal, the spot where they would drop out of the mountains in front of San Gregario and take a hard left onto Highway 1. We decided that the trees in the mountains would provide at least a little cover, and so headed to the first KOM at Tunitas Creek and Skyline. We'd eyeballed the racer's arrival at around 10:30AM, so we left my apartment a bit after 8 in order to get there with enough time for a good spot. On our way up, we were amazed by the number of cyclists who were riding. Just for a moment, forget the miserable weather. They were ascending incredible gradients, pounding their way up slopes that would stop me flat. Best of all, everyone was really cool. The motorists gave the cyclists plenty of space, and the cyclists kept to the right and waved people around blind turns when it was safe. I have a hard time judging distances, and the whole way up I was trying to estimate where I would be just short of Skyline. I'm glad I kept on going, because eventually we got to a spot that was both perfectly obvious (with lots of other cars parked) and perfectly situated (plenty of room to parallel park) and perfectly located (probably less than a quarter mile from the summit). Up on Skyline, we saw that some people had erected booths and were giving out free coffee and pancakes. Wow! That's amazing. We milled around for a little while, then headed down Tunitas Creek for a few dozen yards past the official KOM signs. People were already filling in, so we staked out a good position where we could see the riders come up and around a bend, navigate an S around an outcrop, then pass us to hit the KOM. As on previous days, people were great to watch. There were a few low-grade jerks who stood in the middle of the road or bothered others, but even they quickly passed, and the vast majority of folks were just happy to be there, rain and all. I was amused to see how many people were obsessing over their cameras. It shouldn't amuse me - I've definitely done so myself in previous years - but this time I just wanted to enjoy and actually watch the riders. Not to mention that the rain meant that no matter how hard you tried, you wouldn't be able to get a beautiful picture. It felt like a pretty long wait, but we kept our spirits up. Finally the police cars started to move through and people moved at least a little back from the pavement. Eventually the five-man breakaway crested, the crowd went nuts, vehicles roared by, more bikes came, more cheering, and so on. This part of the road was so incredibly narrow that everything was all jumbled together, with cars driving within the peleton, riders moving back and forth beside them. And lo, a sign appeared to us: a sign of sun! Almost at the moment the first riders came by, we got our first break in the clouds in two days. It warmed our faces and our hearts. We clapped clapped clapped, then swiftly walked back towards our car. I had originally thought of this as a single-spot day, but with San Gregario gone, we'd realized that we would have time to drop into Santa Cruz for the finish. We spun around, shot down 280, dropped through 85, then hit the summit on 17. The rain up here was as bad as ever, and we slowed down for a section as a lane closed to deal with a mudslide. Eventually we reached the city, with plenty of time to spare. In start contrast to Santa Rosa, Santa Cruz has an EXCELLENT city web page for the Tour, and in just a few minutes the night before I knew exactly where I wanted to park, where the shuttle would take us, and roughly what the route would look like. The rain had mostly given up in the city, so we gladly put away our umbrellas and walked the streets like real human beings. The spot near the finish line proper was absolutely packed, so we walked further in. We eventually settled on a sweet corner, Walnut and Center. Corners are great because the riders need to slow down to take them, and as a result you can see them for longer. Plus, I suppose that we all have a dormant NASCAR gene that's wondering if a rider will slam into the wall and explode. We had a pretty short wait here, and because the sun was out it could have been much longer without us minding. Dad struck up a conversation with a gentleman next to us, and found out that he was from the South Side of Chicago and still had family in the western suburbs. We had a really nice long chat about Santa Cruz and other topics of small talk. The race had gotten seriously shaken up in the mountains. The five-man breakaway had vanished, and we saw just two riders pounding their way past. One was Levi, and we would later learn that the other was a 22-year-old who ended up winning the stage. The rest of the race was just a little weird... not bad at all, but the mountains and rain had done some serious damage, and so the riders were much more broken up than one would expect at this stage of the Tour. Everyone got plenty of cheering. I'm quite surprised that my voice isn't at all hoarse after three days of this! The race finally over, we resolved to enjoy the remaining sun and the Santa Cruz atmosphere. We found a great casual falafel shop - this one was Syrian, so it spelled things a little differently, but was still utterly delicious. Dad got the veggie combo plate, which came with all sorts of good stuff like baba ganoush, hummus, and falafels. I got the chicken shawarma sandwich, which was also amazingly tasty. Anything tastes good if you're having lunch after 2 in the afternoon, but this would have been good regardless. The rest of the afternoon we just wandered. First down Pacific, then up the San Lorenzo river, then through some side streets. Most of the roads downtown were closed, making this picturesque city even more pleasant to visit. We dropped into Books Santa Cruz for a bit to browse, Dad grabbed some coffee at Peet's, and we eventually took the shuttle back to the car and called it a race. Monday night we ran down the trip very peacefully. Well, it was peaceful after we dominated some songs on Rock Band - Dad complained, but did a great job on both drums and guitar. We cooked up a new recipe for me, Skillet Penne with Broccoli and Sun-Dried Tomatoes, which came out quite well, and served it with some Pink Lady apples and sweet potatoes. The rest of the night we watched some IT Crowd and Flight of the Conchords before giving in to slumber. Dad had originally planned to come into the city with me on Tuesday, but we agreed that after the last few days, he had more than earned a break from the rain. And so ended the Tour of California 2009 - at least, the part that matters! Given how rotten the weather was, it'll be interesting to see if this continues to be a tradition, either for myself or for California itself. I'm quite adaptable, though, so even if the Tour as such isn't as big a draw in the future, I'm confident we can find another excuse to have family visit. Ahhh... Civ is truly the game that keeps on giving. Its latest official incarnation from Firaxis is a total conversion into Colonization. Colonization was one of my beloved games when I was growing up... perhaps not as dear to my heart as Civilization, but then again, few things were. The new game, called "Sid Meier's Civilization IV: Colonization," is a blast. It captures the fun of the original, corrects some of the old annoyances, provides a great shot of modern features, and remains quite distinct from (yet evocative of) Civ IV. I'll run through a quick(ish) narrative of my first game while it's still fresh in my mind, then run through an analysis. OK, go! They kept the four colonial powers from the original: you can choose to play as the English, French, Dutch, or Spanish. They largely have the same advantages as the original - English have better immigration, French have better relations with the natives, Dutch have some advantages in trade, and the Spanish are better prepared for combat. They've added the idea of multiple leaders from Civ IV, though, so you have a choice of which leader to play as, which provides more modification. I opted for the English, as I always did in the original. My choices for leader were George Washington, who gave some combat benefits, and John Adams, who gave a 25% boost to liberty bell production. I went for Adams, and renamed him Alexander Hamilton, because, come on, why wouldn't I? You start off with a tiny ship, a few colonists, some tools and some muskets. In my first game I was extremely unhappy with my starting position - no lumber at all - so I called a do-over after 10 turns and rerolled. The next game was odd, but worth keeping. I founded Jamestown on a spit of land that reached eastward into the Atlantic. Not counting the city square, there were only three land tiles to work, as opposed to five sea tiles - typically an awful proposition for a city. However, two of those sea tiles had bonus Fish resources, one of the land tiles had Corn, I had dense forest and some hills. In other words, I wouldn't make any money at all off of this city, but it had the potential to support a giant population - think preachers, statesmen, etc. - and seemed like the perfect spot for a capital. Colonization has many similarities to Civ. It's turn-based; you move units around squares on a map; you found cities (here called "settlements"); you engage in diplomacy, trade, and (possibly) war with other civilizations. It has many more differences, and the biggest one of all is the different aim. Civ is famous for providing multiple paths to victory: I have won (and greatly enjoyed) games where I never fired a single shot. Colonization only has one way to win: you must declare independence from your mother country and defeat the King's forces. That doesn't at all mean that it is a military-only game, though. Civ allows you to choose which axis of the game you want to focus on (science, production, combat, diplomacy); to succeed in Colonization, you need to become good at everything. Sure, it comes down to a war, but to win that war you'll need soldiers, guns, and horses. To get those things, you'll need a sufficiently large population and a strong economy. Both of those require you to become good at trading: finding the best and most accessible resources, developing settlements to produce them, then investing by upgrading your manufacturing capabilities. And since any shock can disrupt the flow of cash and crimp your growth, you'll need to manage relations with the natives, other European powers, and the insane demands of your king. So, in a sense, there's less freedom here than there is in Civ, but that isn't a bad thing. The game prompts you to work hard at everything, and keeps it interesting throughout. After founding Jamestown, I spent some time exploring. I was lucky enough to get a Seasoned Scout from Europe fairly early on, and with him I explored my continent. I was very close to the Sioux, who as usual were very friendly and provided me with free goodies. I eventually found the other Europeans, and allowed myself a smile. The French and Spanish had landed right next to each other, in the other hemisphere from me. I wouldn't need to worry at all about them crimping my expansion. The continent was oddly shaped, reaching all the way from the north to the south pole, with a large vertical inland lake that divided the middle into two portions. There was only one area where a settlement could offer a canal between the Atlantic and the Pacific, and the French soon built one there. From the original game, Colonization keeps the idea of Founding Fathers. These sort of replace both wonders and technologies from Civ. There is only one of each Founder, so if I recruit, say, John Jay, then you can't take him as well. Each Founder provides a specific benefit. These are all over the map, from improved relations with the natives to combat promotions to free units to increased production of cotton, etc., etc. The way you get founders has changed a lot, though. Well, they're still mainly driven by Liberty Bell production. In the original game, once you got a certain number of bells, you'd receive a pop-up. You'd have a choice of five Fathers, and could select whichever one best matched your needs at the time. It was a somewhat random process; you never knew which Fathers would be offered. The new game is much closer to researching a technology or building a wonder. Each Founder requires a certain number of liberty bells, and also a certain number of special "points". There are different types of points, namely Exploration, Trade, Military, and Diplomacy. You get Exploration points by revealing the map, contacting native tribes, and stuff; you get Military points by engaging in combat and building military buildings like stockades; and so on. So, to pick an example, Eli Whitney might require 6000 Political Points (Liberty Bells) and 4000 Trade Points. Once you have earned both the required political and trade points, you'll get a pop-up asking you if you want to recruit him. If so, he'll join your Continental Congress (in this case, that means +50% Cotton in all settlements), the 6000 and 4000 points will be deducted, and no other power will be able to recruit him. Because of this, some more strategy goes in to picking your Fathers. I passed on the very first one offered me, which reduced the time to travel to Europe by 50%, because I had my eye on some later ones. Simon Bolivar grabbed that one, but I was able to pick another Exploration Founder that provided more Treasure from ruins and burial grounds. Oh, yeah. The whole "goody hut" thing from Civ has changed. In the original Colonization, there were special tiles that looked like a gold coin and were called "Rumors of Lost Cities." Anything could happen there - attacks, maps, lost colonists who join you, one of the Seven Cities of Gold, or even the Fountain of Youth (causes an enormous explosion of immigration). There were also Indian burial grounds; they could produce treasure, but would anger the natives into attacking. The new Col loses the Rumors; there are now both Burial Grounds and Ruins. In both cases, if you explore with a Scout (preferably a Seasoned one), you may get some treasure. I like treasure way more in this game than I did in the old Col, mainly because Indians no longer automatically attack it like they did in the original game. All that to say, getting this Father helped me more profitably exploit those ruins, which gave a great boost to my treasury in the crucial early part of the game. But, if I'd been offered him later in the game, I would have passed, having already explored them all. I eventually realized that I was in a weird position on a weird map. There were open plains to the north of me, with some nice food but no resources or trees at all. I had ocean to my south and east, so the only other option was westward. I planted my second city at Plymouth, where the coast dropped 90 degrees from east-west to north-south. Plymouth was never meant to be a large city - good thing, too, because there was almost no food there. No, I built it just because it had a Prime Silver vein. I reasoned that I could stick a silver miner there by himself and get a nice, steady income stream from it. This worked out pretty well; later on I did add some extra folks (lumberjack, carpenter, native fisherman), but it was a pretty modest producer. I eventually found a killer site: two Tobacco resources and one Cotton, some timber, light forest covering plains, and a river running through it all. In both Cols, you can only work the 8 squares around the city, not 16 like in Civ, so location is even more important. This city had the potential to drive my entire economy. Just one hitch: it was super far away from my capital. If you imagine Jamestown at being around the location of Atlanta, then Roanoke (as it would be named) was roughly located in a verdant Phoenix, Arizona. (Plymouth was kind of like Houston.) By this time I had grown enough for a couple of pioneers, so they began carving out a roadway westward. I started my covered wagons moving between the two, early on driving food out to Roanoke (they would eventually cut down some light forest and set Expert Farmers for a nice surplus), and bringing back tobacco and cotton. In the early days it could take 12 turns in each direction. After the roads were built, I had a nice streamlined system down. About 2 turns from Roanoke to Plymouth; the wagons would dump their cargo there, then turn around back to Roanoke. Meanwhile, other wagons would make runs from Plymouth to Jamestown, where cargo would then be shipped to Europe. Once this system was in place, I was finally producing reliable income (not just an occasional grand from a ruin). I turned this money back around. I bought experts in a few fields I was missing - as in the original Colonization, in Europe you can pay a lot of money for a highly-trained immigrant. The ones I needed came relatively cheap: 1000 gold each for expert Carpenters, some Lumberjacks. Back in the New World, I began sending colonists into native villages. My seasoned scouts had spoken with every village chief, and, in a huge improvement from the original Col, you could now see from the main map what specialty each village could teach. The colonists learned trades as expert fisherman, expert farmers, and (not even available in Europe) expert cotton planters and tobacco farmers, kicking Roanoke's economy into overdrive. The cities were now regularly producing buildings and the flow of cash was increasing. Roanoke now started to upgrade its facilities, eventually creating a textile mill and cigar factory. Now it was producing finished goods which could be sold to Europe for an enormous profit. It was now common for me to earn 5000 gold or more on a single Galleon run. Around this same time, I planted my fourth settlement, Barbados, almost immediately west of Jamestown. I had bypassed the site earlier because it didn't have any special resources. On closer examination, though, I realized that the three peaks separating it from Jamestown could supply a great deal of ore, especially once they were mined and staffed with experts. And, after playing too many of these games on the original Colonization, I also knew to look and check whether I had sufficient timber and agricultural capacity. Yes on both counts. Barbados was founded for much the same reason as Jamestown: it would probably not make me a dime, but would be a crucial tool of the Revolution. Literally so. Ore gets produced into Tools, which are essential for most important buildings, for creating cannons, for building warships, and for producing muskets. Soon after I started earning real money, I borrowed a favorite old Civ tactic and bought a Privateer. This was a really fun unit, an attack ship with hidden nationality that you could use to harass your European rivals without declaring war. I spent a few decades having fun with him, sinking their caravals, plundering their cargo and selling it to England, then returning and doing it again. I found myself getting progressively more annoyed with the Spanish and French - they kept on taking Founding Fathers, occasionally ones who I actually wanted. I decided that it was time to take them down a notch, and in the process get used to Col-style combat. I bought some muskets and horses from Europe, picked up a Veteran Soldier through immigration and purchases another, then conscripted some low-producing colonists to join me. With this small band, I first started gaining experience by attacking the Sioux. Relations had sourced in recent years... they hadn't actually raided my settlements, but it seemed like a matter of time. Most crassly, I was upset that they wanted over 5000 gold in order to build a fifth city in their territory. (In the original Col, you could found a city near Indian land. You couldn't work any tiles belonging to the Indians unless you paid for that tile, or you took it from them, which would harm your relations. In the new Col, you basically need to pay for ALL the tiles when you found your city, or incur their wrath.) As in the original Col, fighting the natives was fairly easy. I'd actually earned a ton of money earlier in the game by selling muskets and horses to various Indian tribes, including the Sioux, but they only had enough for a handful of units. I took a sort of blitzkrieg approach, declaring war on them and then taking out two of their villages within a few turns, then promoting and healing my units before combining the two forces and marching on their capital. It was a little dicey for a while, especially when I left some unguarded pioneers nearby. Units with the Ranger II promotion have double movement through forest squares, so unless you pay close attention to your opponent's promotions, you can easily be caught off guard. It all worked, though, and eventually I had subdued the Sioux and earned both liebenschraum and promotions. Even better, I had acquired a Great General. This concept was important wholesale from Civ IV: Warlords. You can attach a Great General to one of your units, providing a huge boost of 20 XP, and providing access to some wonderful promotions that are only available to Great General-led units (like +50% XP per combat, Ranger III [huge bonus to attack and defend in forest, which you can now do multiple times per turn], Healer III, Combat VI [+50% Strength], etc.). Elated, I acquired some more military hardware, then put trade with Europe on hold for a while as my cargo ships ferried the army north into Spanish territory. The Sioux war had been easy and rather long; the Spanish war was weird and rather short. I think they just had three cities, and because I had not declared my intentions in advance, they had made absolutely no preparations for me. Some cities didn't have any soldiers mustered outside. Once I realized how puny their defenses were, I abandoned my initial plan (fortify in forested hills outside their settlements, bombard with cannons, then attack with the cannons and dragoons) for a lighting strike approach. I sent my soldiers directly from the landing craft into their settlement. Now, as in the original Colonization, citizens will automatically pick up arms if they are available and defend, but still, it was only a handful of attacks until their defenses were wiped out. I razed the settlement to the ground, landed my cavalry, and swung farther north and east. I did some guerilla fighting as I marched inland. Rather than fortify his remaining units behind stockade walls, Bolivar rode out to meet me. By this time I had picked up a few Ranger promotions, and had a good enough mix of units that I could pick him off at my pleasure (Dragoons against Artillery, Soldiers against Dragoons, etc.) I faced unexpectedly fierce resistance once I reached Havana, which only had a few soldiers left, but still put up rather fierce resistance. They too fell, and I was victorious. Well, sort of. Unlike in Civ (and possibly unlike the original Col, though I'm a bit fuzzy on that), a European power isn't destroyed when their last settlement goes away. Bolivar still had a few land units left roaming around, and a few decades later he came back from Europe with a fresh ship and re-settled. Still, I had dealt a mortal blow. He would no longer be taking my Founding Fathers from me. Flush with enthusiasm, I resolved to immediately continue the fight north. New France was larger than New Spain, but I quickly realized that it was even less prepared for the onslaught. By now I had all three ships hanging around, my Caraval, Merchantman and Galleon. Each picked up a unit or two and swung out near a coast city, while my fast-moving dragoons lurked inland. I diplomatically declared war, and on the very first turn half of their settlements burned. As before, the final holdouts were a bit trickier, but the outcome was never in doubt. Now my empire truly did extend from sea to shining sea. A quick note on spoils: when you capture a European settlement, you automatically get some cash, and then can make the standard Civ decision of whether to keep it or burn it. Colonization doesn't import the notion of corruption from Civ, so it can be tempting to hold on to it - it won't drag down production or commerce elsewhere. In my case, I decides without much hesitation to burn. Importing more citizens would drag down my Liberty rate; the cities were in locations that were just OK but not great; and, more importantly, they were so far away from my core that it would be impossible to unite them. let alone work out a coherent defensive strategy once the Redcoats landed. The one settlement I hesitated over was the French colony I thought of as "Panama", the one that connected the two oceans. I eventually decided that it wasn't worth it, and in any case I wouldn't gain anything from accessing the Pacific. So I burned them all. It isn't a wash, though. In addition to the cash, you also get a free wagon train. I kind of wish I had known this in advance; I had built a few before, and would have held off if I'd known I'd be getting another half-dozen for free. Capturing a native village is different. You automatically destroy it; there's no option to keep it. You get a Treasure unit, which can be puny (the Sioux's were under 100 gold) or substantial (traditionally, the Aztec and Inca are loaded). In addition, you get a free Converted Native. These have been around since the original Col, but I never used to do much with them - you'd have to invest in missionaries to get them, and my missions had a way of getting destroyed. But they are quite useful. They act as Experts (or close to it) for any sort of fieldwork - fishing, mining, planting, etc. As a tradeoff, they are less effective than Colonists at city trades like Statesman, Cigar Maker, etc. Additionally, I was disappointed to learn that they couldn't be turned into soldiers. Hey, that's the reason I captured them: because they were fighting! What, they forgot how to fire my muskets? By now I was starting to think towards the endgame. I had picked up some good promotions, gotten another Great General, and finally had my choice of the remaining Fathers. I did some plotting. Now that the Sioux were out of the picture, I could finally found Bermuda; a mere squares from the old Sioux capital, this coveted colony could access two prime Beavers and the best timber on the continent. It would have been a nice cash cow if I'd founded it earlier, but I could already sense that it might never reach its full potential. I reviewed the list of Fathers and picked out a few that I would definitely want for the war. Specifically, there were several Military ones that provided free promotions to all units; some Political ones that would boost my Liberty Bell rate; Alexander Hamilton (that's me!) who is just awesome; and Roger McCormick, who provides extra food. Basically, I wanted to get to the point where I was churning out new citizens and guns, combining them into trained soldiers, and repeating. In order to get the remaining Military points I needed, and pick up some more Great Generals, I decided it was time for one last glorious Indian war. My units sailed or marched all the way back down to Jamestown, then swung out west. Everyone left pretty much liked me, but the Aztec were the last happy with me, and I lusted after their rich cities. Interestingly enough, I was especially tempted by how strong and vast their army was. This is the opposite of my usual attitude in Civ, where I only engage in war as swift surgical strikes against weak enemies. Here, my aim was to fight as much as I could and destroy a ton of units, even if it meant delays of capturing cities. Sure, they had numbers, but I was well promoted, and confident in my skills. I divided my army into four, parked outside their cities, then attacked. Cheered. Pressed "End Turn". Watched in slack-jawed amazement as they utterly destroyed my army and marched on Roanoke. Clearly, a new strategy would be required. I swallowed my pride and reloaded a save from a decade earlier. I realized that I had made a few miscalculations. First, the sheer number of units they had could easily wear me down. Second, I hadn't paid attention to their promotions; as before, some were double-movement Ranger IIs who could swing out and attack my flank. I cut back on my ambitious battle plans and created two massive columns, each a mix of horse, boot, and wheel. As before, I parked my guys in well defended spots, then declared war. This time the soldiers didn't participate; they could take advantage of the +50% or +75% terrain defense bonuses, and could hold down their squares. I'd planned on using cannons to bombard, but realized that the Aztec didn't have any defenses to protect, so I attacked their city units instead. Cannons are unstoppable when assaulting cities, so they led the way, followed by dragoons. By now I had some medic promotions in both columns, and when someone got low enough, they could rest a few turns and then continue the assault. Montezuma was none too pleased with me, and went on the war path. To his credit, he didn't bother attacking my highly defensible positions; instead he sent out invaders into the forest, making their way (I presume) towards Roanoke and undefended units. So, the rhythm I settled into was that my dragoons would chase down his braves while cannons pounded his settlements and the soldiers dug into the hillside. It was all pretty effective. Both villages fell, I sent the treasure and prisoners back into my colony, and the columns advanced towards their next target. Throughout the entire game, the King had been steadily raising my tax rate. The worst was a single jump from, I think, 5% to something like 16%. As in the original Col, you can refuse a tax increase by holding a party, which means you can no longer trade that good with Europe. I like the option, but he would pick things that I really needed, like (early on) guns and tools, or things that I absolutely needed to trade, like cigars and cloth. Towards the end of the game, I finally began to refuse him, but was disappointed to see that he would come right back in a few turns with another tax increase. He also will randomly ask you to give him large flat sums of money. And the artists did a phenomenal job of making him look absolutely hateful. I never did quite figure out what the consequences were of angering the King. I would assume that it has some impact on how frequently he adds units to his Royal Expeditionary Force, but could be wrong. I was steadily gaining Liberty Bells throughout the game. This is kind of risky, since the King will grow alarmed as rebel sentiment increases and build up his forces, making the endgame harder. Still, I really wanted those Founding Fathers, and it just seemed more fun to tweak him a little. Plus, Liberty Bells have some nice extra benefits in the new Col. In the original, you would get a production bonus in a colony that reached 50%, and another bonus if it reached 100%. Here, every col gets a bonus equal to half their liberty bell rate - for example, if a fisherman usually would catch 10 fish, and you have a 60% rebel sentiment, then he will get a 30% bonus for a total of 13 fish. Liberty bells also act like culture in Civ IV, so they expand the size of your borders - not hugely important, since you can't work anything outside your immediate radius, but it does protect against hostiles, and presumably would help you in land disputes with the Indians. Finally, your rebel sentiment also provides a defensive bonus for your cities. For all these reasons, I wanted to generate some bells throughout the game. I figured that I would wrap up the Aztec War, then as the soldiers headed home and took up positions, I would import Elder Statesmen via my bloated treasury, deploy them throughout the colonies, and get a nice big boost towards the magic 50% for independence. In preparation, all of my colonies (even puny little Plymouth) built printing presses and newspapers, most of which stood eerily vacant, waiting for a hand to inspire them. The war with the Aztecs ended triumphantly. I realized that I would need a little more time to get my economy absolutely in place, so I started cashing out all my gold, picking up a few final strategic pieces (an additional Expert Rancher and Expert Gunsmith for Jamestown, Carpenter and Lumberjack for Bermuda), and blowing the rest of the cash on cannons and veteran soldiers. By the time everything was in place, Jamestown was churning out over 40 guns and 30 horses every turn - basically enough for a soldier every turn and a dragoon every two. I wasn't ready to start drafting, so I deputized a few wagon trains to begin ferrying armaments throughout the empire. I still wanted Dom Pedro, the last and best Military Father, so I had a final unplanned war against the puny native tribe immediately to my north. The dragoons were burning their villages as my ships made their final return from Europe, carrying the Elder Statesmen who would show us the way towards freedom. A few tense and quick turns followed. All the military either fortified in an eastern city or took up temporary employment within the town. Statesmen rushed out to the western cities, where rebel sentiment was still rather low. The wagon trains were either pressed into military service, or else filled up on manufactured goods and headed overland towards the remaining native tribes. After pressing Enter a few times and turning down an increasingly demanding King, I finally got the much looked-for message that I had passed 50% sentiment. Now, in the original Col, I would have been tempted to keep driving this up towards 100% for the maximum benefits. However, by this point the King was adding new units almost every turn, and his standing army already outnumbered mine by more than 6 to 1. So, as soon as I had the chance, I declared independence. A really cool little video followed - cool, except that it both shows and says "1776", which was clearly not the case. I had declared my independence just a few years after 1700, and a helpful countdown timer reminded me that I had fewer than a hundred years in which to win the game. Next up was a VERY cool part: when you declare independence, you get to draft a constitution. You choose your nation's path on each of five axes, and they're all interesting decisions. The first one is a real gut-wrencher: slavery. My white liberal guilt led me to pick abolition, but still, I'm quite tempted... picking Slavery will provide a substantial boost to almost all resource production (food, lumber, hammers, tools, etc.) throughout your empire. Emancipation, by contrast, will give you an extra 2 citizens in every city you control. I wouldn't realize until later that those citizens are Indentured Servants - makes sense, of course, but still a bummer, since they aren't as good as Colonists at anything. That is, anything but fighting. I basically had just received 10 soldiers or dragoons who were just waiting for armaments, which I had in ample supply. The other decisions are just as interesting, if less morally fraught. Picking Monarchy will let you continue trade with Europe, while Elections will give you a boost to Liberty Bell production. Neither seemed very useful to me - I wouldn't be able to get my ships past the King's Man-o-Wars anyways, and my most strategic cities were already near 100% Rebel Sentiment - so I opted for Elections. In retrospect, I do wish I had chosen Monarchy. First of all, playing as Alexander Hamilton, it just feels right. More importantly, though, I realized a few turns later that I could no longer pay to rush construction, which meant that the close to 10,000 gold I had held in reserve for some critical final projects (fortress, arsenal) were useless. After reading up in Civilopedia, I think I finally understand why: what you're paying for when you rush build is the cost of the rush, plus the cost in Europe of lumber and tools required by your project. I bet that, if you can no longer buy lumber or tools from Europe (possibly even as the result of a Tool Party), you won't be able to rush. So that was a bummer, but not a fatal one. Anyways, as for the rest: I chose Native Rights for a boost to my relations with them; I wasn't going to be fighting any wars against them, and thought there might be a chance I could get them to fight the King with me. (No such luck, but I think this might be because all the surviving Natives were too far away to even meet his units.) Because crosses become useless once immigration ends, you can choose either Religious Freedom to turn them into liberty bells or Theocracy to turn them into hammers. I picked Theocracy - as noted before, I was in pretty good shape for rebel sentiment. Finally, you can choose the Right to Bear Arms for a strength boost or Gun Control (I think it's called something different) for more liberty bells. On this day, I was all about the Second Amendment. The final thing I did this turn was flip through all my cities and turn them from a commerce footing to a war footing. It would have taken too long to rearrange everyone manually, so instead I used the governors. I really wish that I had used this earlier in the game: I'm used to the friendly AI being poor, but this aspect at least was really well done. You can view a list of all possible production (tobacco, silver, tools, crosses, etc.) and for each pick "Emphasize", "Deemphasize", or "Neutral". Then, automate all your citizens (which you can do in one click) and adjust as necessary. Again, I was shocked at how well this worked. It would have taken a long time to figure out what to do with Roanoke, which was entirely devoted to cash crops and manufacturing, but the AI did an even better job than I would, and so it was transformed overnight into a bread basket, capable of churning out a new citizen every few turns and exploding its low Rebel Sentiment standing. Satisfied with all my cities, I did a final save, then pressed "Enter". Repeated a few times. I wished that the game would play ominous music to impress on me the seriousness of my situation, and I could imagine rows upon rows of redcoats braving the choppy Atlantic waters as they sailed westward. I'd expected to catch sight of them soon, but they invaded the instant they appeared. I was left gasping. Which meant I was still alive. I'm still unsure how I feel about the military AI. It seemed like about a third of the King's Regulars directly invaded Jamestown from off their boats. I noted later that some of the Regulars had the Amphibious promotion, so I guess this is somewhat logical - if they don't get that 25% penalty, then you might as well take advantage of it. Still, it was pretty suicidal. In the first wave, I fought off, I dunno, maybe eight attacking Regulars, and only lost a single defender (though the rest were badly wounded). He also unloaded quite a few royal dragoons and artillery (like cannons, but worse), protected by a handful of additional Regulars for defense. When my turn came, I counter-attacked with a vengeance. None of my Dragoons had even gotten a chance to defend, so they were at full strength. I led the charge with units that had extra withdrawal chances, softening up his strongest defenders while staying alive. Then I struck hard with the highly combat-promoted general-led units, who crushed them. I returned to playing rock-paper-scissors, sending in my dragoons against artillery, soldiers against dragoons. I lost one or two more units, but at the end of my turn had wiped out all but a handful of units who were established in a forested hill. There, I brought some defenders out of my city, and sat next to them, waiting for them to attack. There were so many enemies, I had figured that this was the entirety of the first wave, but I was wrong. On the very next turn, a few more ships unloaded into Jamestown. I lost some more units, including a Great General, but still held strong. The landed forces struck against my outside defenses, and broke. A few roads were pillaged, so I brought my pioneers back in for repairs. He repeated the landings from before, but with fewer units this time. I had kept some guys in reserve in Barbados, so these fresh dragoons swept in and annihilated his expedition. Like I said before, I'm a bit skeptical about the AI. If our positions were switched, I would have landed all my units in the one defensible position adjacent to Jamestown, a forest square. Then everyone would have attacked in a single turn, not giving me time to recover from each blow. By splitting his attacks across three turns, the king severely weakened his chances; a more coordinated assault could have been the death knell for liberty. I was pleased to see that my tactical gamble had paid off. Unlike the historic English colonies, which were arranged north-south along a coastline and all roughly convenient to England, I was arranged east-west along a coastline, with only Jamestown nearby and the bulk of my population farther inland. Because of this, I had concentrated 95% of my forces in Jamestown and Barbados, with only token defenses in my other cities, including the port of Plymouth. As a result, I was able to directly match the King's army. I did get a little nervous when I noticed two Man-o-Wars heading westward - it didn't look like there were any units on board, but then again, I'd never been able to see any before they landed, and wondered if they were somehow hidden. It turned out that they were empty, though. The King spent a few turns bombarding the defenses of Plymouth and Jamestown, but didn't land any more units. The ships finally broke off and sailed back east for reinforcements. Jamestown finished its fortress at last. Much like America after the Battle of Saratoga, I was now confident in my ultimate victory, even though it would take many more long years to appear. There were four more waves of invasion, each a little weaker than the one before. He never tried to land any farther west than Jamestown, and before very long I was successful in the war. Hooray! Overall, I was delighted with the game. I think I'll try some more specialized strategies in future attempts, such as doing a French game where I build up a coalition of natives to help me fight the King, or a game where I try to declare independence as early as possible (while the REF is still small). That dastardly King of England! Oooh, I hate him so much! Education - it sounds cool, but takes forever to train a student, and you don't learn until the end that it also costs money. Wasted opportunity. Frustration with the Founding Fathers - specifically, if you pass one up, you'll never have the chance to recruit him/her again. This really hurts the strategy aspect, since you're encouraged to take every one you even vaguely want as soon as they're offered. Just the risk of losing them to another European power should be enough to make it an interesting choice, not losing them forever. Really fun combat. It's easier to keep straight than Civ, since you have a total of 3 units to learn, rather than over 30; at the same time, unlike the original Col, each has advantages and disadvantages over the others. Awesome endgame. The traditional knock against Civ is that it is fun and fast-paced early on, and becomes slow and plodding at the end (you're either trying to find and capture the last few cities on the globe, or pressing "Enter" several dozen times as you build space ship parts, culture, etc.). Here, the endgame was the most entertaining part of an already really fun game. Interesting choices. This is a Civ staple, and I was constantly evaluating trade-offs. Do I attack the Aztecs or maintain my happy peace? Will the extra commerce from Penebscot be worth the delay in achieving high rebel sentiment? Do I make peace with my defeated European allies or continue the fight? Once again: well done, Firaxis! Thanks for a nifty piece of entertainment. Up next: I can has Alpha Centauri 2?